Introduced in vSphere4.1 VAAI is a feature to offload storage functionality to your storage array, reducing the load on your ESXi host as well as speeding up operations. VAAI features are enabled by default although functionality depends on your storage array’s support. There are limited GUI options for VAAI administration, and several from the CLI. To check if VAAI is enabled (for a given datastore) from the VI client look at any view which lists Datastores. There is a column named ‘Hardware acceleration’ which is either ‘Supported’, ‘Unsupported’ (or ‘Unknown’ if a VAAI operation has yet to be tried on the datastore, or some primitives are supported and some are not). VMwareKB1021976 is a VAAI FAQ and is worth a read, as is Sean Duffy’s post which covers using ESXTOP with VAAI. There are some situations where VAAI will not work and it’s possible the exam could test them. Jason Langer has a good post about VAAI and Netapp which details some good troubleshooting steps. The official VMware docs on VAAI are worth a read as they go into details about the VAAI claim rules and filters. Check licensing – storage profiles are an Enterprise+ feature. Enable Storage Profiles (they’re disabled by default). System Defined. They are automatically populated if your array supports VASA functionality, the VMware API for Storage Awareness (this requires a vendor supplied plugin). User Defined. The user has to define capabilities and there’s an extra step to associate them with datastores. Combine one or more capabilities to create a Storage Profile. Assign a storage profile to a VM. Check compliance either for all VMs (from the Storage Profiles view) or a single VM (via the context menu). Mike Laverick has done a good blogpost on storage profiles with both Dell and Netapp storage arrays, as has Cormac Hogan over at the official VMware storage blog. Section 20 and 21 of the VMware Storage guide cover Storage Providers (VASA) and VM Storage Profiles respectively, and Scott Lowe’s Mastering VMware vSphere5 book has good explanations at pages 298, and 341. There are two main places to look in the VI client – Storage Providers (for VASA) and VM Storage Profiles, both on the homepage. VASA is enabled if there are entries under the Storage Providers tab on the vCentre homepage. A datastore can only have one system-defined capability and one user-defined capability. Each VMDK can have a different storage profile associated to it. Storage Profiles are NOT compatible with RDMs. Many of the views are not always up to date – click Refresh to be sure. It’s possible to create storage profiles (and capabilities) and even associate them with each other, even if storage profiles are disabled! When you check for compliance they’ll fail with a message that ‘Storage Profiles are not enabled’. It is possible to create a storage profile with no capabilities but any associated VMs will show as Noncompliant. Applying a storage profile can take a while so if you check compliance immediately it may show as failed. The Noncompliant messages are rubbish – they don’t specify any detail to help you track down the mismatch! Attaching/detaching links the block device presented by the storage array with the ESXi hosts. Mounting/unmounting refers to a datastore created on top of the storage device (VMFS or NFS). For example when a new block device is found while doing a HBA scan it’s automatically attached to the ESXi hosts. You can then mount a VMFS datastore within that device. 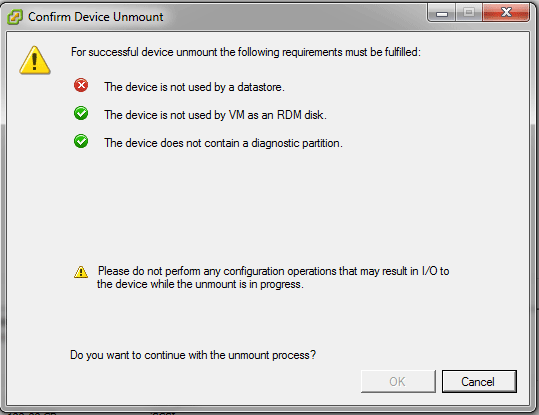 To cleanly remove this storage you need to first unmount the VMFS and then detach the block device. This distinction is new to vSphere5 and has been added to help prevent the All Paths Down issue (which was largely resolved in vSphere4.1 U1). It’s interesting to note that the APD issue does still exist in vSphere5 (VMwareKB2004684) although work has been done to minimize the occurrences. A hardware failure or the array not supporting the right sense codes can still result in failure of the ESXi host and the hosted VMs. A good reason to be nice to your storage admin and check the HCL! 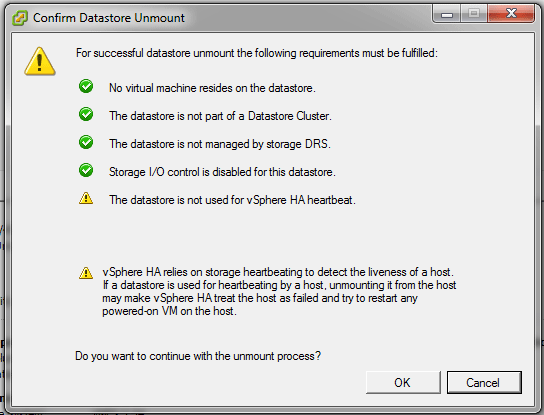 Ensure all VMs are moved out of the datastore, any RDM’s are moved/deleted, Storage I/O is disabled, and it’s not part of a datastore cluster or StorageDRS, or used for HA heartbeating. vSphere checks and notifies you via a dialog to show compliance so you don’t have to remember them. Unmount the datastore. You can do this for a single host (Configuration > Storage) or a group of hosts (Inventory > Datastore and Datastore Clusters). You can also use ‘esxcli storage filesystem unmount‘ if the command line is your thing. It will still be displayed in gray with ‘(inactive)’ beside the name. Detach the block device, which must be done PER HOST. In the VI client go to the host’s storage device view (Configuration > Storage devices) and click ‘Detach’. As with the unmount operation a check runs and notifies you via a dialog so you’ll know if anything needs doing. The setting is persistent across reboots so once a device is detached it will stay that way even if re-presented by the storage array. You’ll have to explicitly ‘Attach’ it (again on all hosts) once the maintenance is complete. NOTE: because ‘detach’ is run per host it’s possible to have a block device (and any contained datastores) available on one host and unavailable on another. The datastore will show as ‘available’ in the ‘Datastore and Datastore clusters’ view, even though some hosts may not have access. There’s no way to detach a device from multiple hosts at once using the GUI but you can use the command line ‘esxcli storage core device set –state=off‘ which is easy to repeat for multiple hosts. Notify your storage team that it’s OK to perform maintenance on the storage. If the storage is being permanently deleted from the array there are a few extra steps to follow on the ESXi host – again see VMwareKB2004605. Another workaround is to mask the LUN at the ESXi host – this is also included in the VCAP5-DCA blueprint but the process is almost identical to vSphere4 (you use ‘esxcli storage core’ instead of ‘esxcli corestorage’). Can be upgraded from VMFS3 nondisruptively both from the GUI and via ‘vmkfstools -T /vmfs/vol1‘ or ‘esxcli storage vmfs upgrade -l vol1‘. Recommended practice is to create new VMFS5 volumes, svMotion all VMs across, and then remove the old VMFS3 volumes. Only vSphere5 hosts can read VMFS5, so only upgrade when all your hosts are upgraded. A list of features, along with which require a clean install, can be found in Cormac Hogan’s blogpost.